MANILA, Philippines - State weather bureau PAGASA in an update released on Saturday, December 6, 2014 as of 11am announced that Typhoon Ruby (international name: Hagupit) has slightly weakened as it continues to threaten Samar Provinces while maintaining its course. Signal No. 3 is now up in 8 areas in Luzon and Visayas regions. The expected landfall of Typhoon Ruby is on Sunday (December 7) early morning over the Eastern Samar – Northern Samar area and it will be associated with strong winds, storm surge (up to 4.5 meters) and heavy-intense rainfall. Typhoon Ruby and the Northeast Monsoon will bring rough to very rough sea conditions over the seaboards of Northern Luzon, eastern seaboard of Central and Southern Luzon, seaboards of Visayas and over northern and eastern seaboards of Mindanao. Fisherfolks and those using small seacraft are advised not to venture out over the said seaboards. At 10:00 AM today, the eye of Typhoon “RUBY” was located based on all available data at 180 km East Northeast of Borongan, Eastern Samar or at 260 km East of Catarman, Northern Samar (12.1°N, 127.0°E). 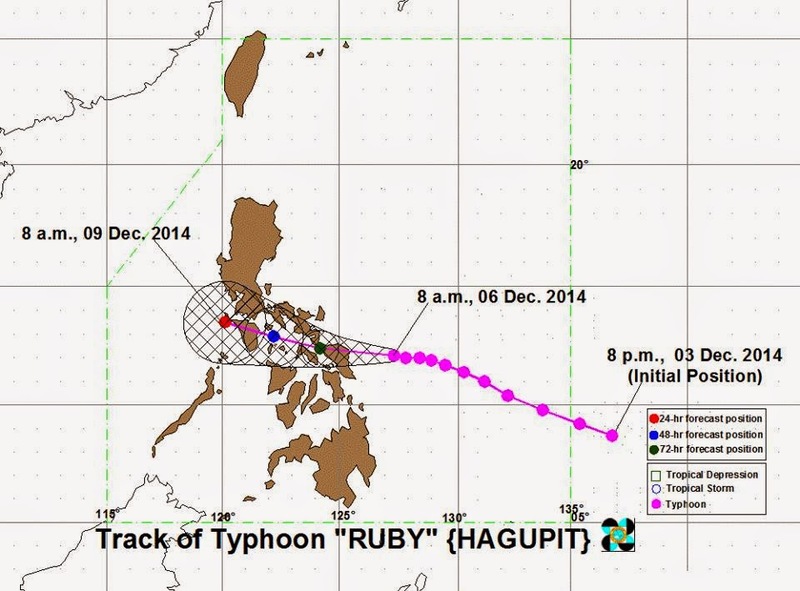 It has maximum sustained winds of 185 kph near the center and gustiness of up to 220 kph. It is forecast to move West at 13 kph. 24 hour (tomorrow morning) 50 km West of Catarman, Northern Samar or at 60 km East of Masbate City, Masbate. 48 hour (Monday morning) 40 km North of Romblon, Romblon or at 125 km Southeast of Calapan City, Oriental Mindoro. 72 hour (Tuesday morning) 115 km West of Calapan City, Oriental Mindoro. Severe damage to Billboards & signages. Electrical power distribution and communication services maybe severely disrupted.